Did the Bush administration kidnap former Haitian President Jean-Bertrand Aristide, or did Aristide leave office voluntarily on Feb. 29, 2004, as the administration alleges? 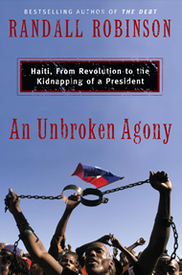 Randall Robinson, in “An Unbroken Agony,” argues persuasively that the United States kidnapped Haiti’s president. He also explains the reasons for Aristide’s ouster. Aristide claims the U.S. military forced him onto a plane and flew him to Africa. The Bush administration claims he left Haiti voluntarily with U.S. help. According to Robinson, there was no reason for Aristide to leave because he enjoyed broad public support, having been elected twice: garnering 67 percent of the popular vote in 1990, and 90 percent in 2000. The wealthy elite, who supported the brutal Duvalier dictatorships, could not accept Aristide’s efforts to improve the living standards of the poor, and planned to overthrow him with U.S. assistance. Haitian society is scarred by great inequality along racial lines: a wealthy minority, composed of whites and mulattos, and an impoverished majority, made up of darker-skinned blacks. Aristide’s government built new schools and health clinics and doubled the minimum wage. It began taxing the rich for the first time. Aristide’s goal was to give the poor an equal footing so they could live in dignity, according to Robinson. The Washington-based International Republican Institute and various U.S. government agencies created a vocal opposition movement, made up of Haitian businessmen, that enjoyed little support among the poor black majority, Robinson says. Also, the U.S. pressured foreign lending agencies to impose a financial boycott on the country, cutting government revenues in half. The February 2004 invasion of Haiti by 200 former Haitian soldiers trained and armed in the Dominican Republic by the U.S. was really a ruse to scare Aristide into fleeing. Aristide never took the bait, Robinson says. In the meantime, tens of thousands of Aristide supporters in the capital readied themselves to defend their president. The U.S. took drastic action. According to the testimony of witness Frantz Gabriel, Aristide’s helicopter pilot, U.S. special operations forces surrounded the president’s house at the National Palace on Feb. 29, 2004. A U.S. Embassy official and U.S. soldiers put Aristide, his wife and Gabriel on a plane and flew them to the Central African Republic. Robinson also flew there with a small group that included Rep. Maxine Waters (D-Calif.). During their visit, Francios Bozize, the country’s president, told Randall and Waters that the U.S. and France had asked him to detain Aristide. Robinson writes that the so-called resignation letter written in Creole — the main language of Haiti’s poor — that Aristide left behind, which the U.S. loves to quote, does not in fact state that Aristide was stepping down as president, according to a Creole language expert. Robinson’s insights are gleaned from his and his wife’s close contact with Aristide and his wife during their painful ordeal. “An Unbroken Agony” is a powerful work that undermines the U.S. government’s account of what happened in Haiti.